As many of you know, I live just a few short miles from the small city of Ferguson. I wanted to support some of the numerous small businesses who are now without a building, or who are trying to clean up after the riots, looting, and arson. I asked a friend of mine, who works in the city, for some thoughts and guidance. He is frustrated because his city has become a synonym for racial bias, protests, and civil disobedience. Yet there was a lot of good things that happened in the city before this summer, and sadly no one wants to know about them before wanting to have a “conversation” or “to effect change.” But let’s talk about something you can do: send money. Here is my modest plan. As many of you also know, for the past 12 or so years I have reached out to you and asked for you to support one of my charitable fundraising efforts that are usually accompanied by an organized bicycle ride. Over the years I have managed to raise tens of thousands of dollars for various causes like Juvenile Diabetes, cancer and MS. Today it is time to raise money for Ferguson. Several of the local businesses now have GoFundMe crowdsourced pages and are raising funds, because they want to stay in business. A few national reporters are mentioning these pages, which is great. I have tried to find ones that are still far behind on their goals but worthwhile efforts nonetheless. I would like you to take a moment, pick one (or more, if you are feeling generous), and send in your money. I have supported all of them to show that my concern is genuine. A couple of weeks ago, I went on a bike ride to the city, along a lovely trail for part of the trip, to have lunch at Cathy’s Kitchen. I have eaten there before, it is a family-run place that has been there for several years and is one of several places owned by the family in the area. They are located across the street from the police station which was spared most of the demonstrations until relatively recently, when they were hit during the riots. Cose Dolci is a small bakery that has also been in Ferguson for many years and also family-run, and just a few blocks away from Cathy’s restaurant. Beauty supply stores in Ferguson were very much at risk, both this summer and then earlier last month during the riots: hair extensions and other care products aren’t cheap. 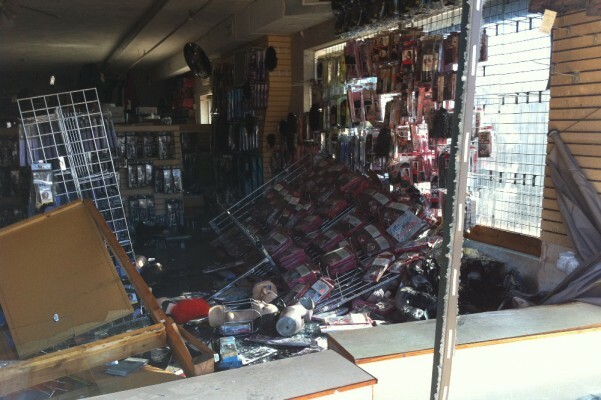 The folks at Beauty World had their windows smashed and a bomb was thrown into the store, and the fire sprinklers soaked whatever inventory was left behind (as you can see from the photo above). Like the others it is also family run by a local couple. Down the street is the Hidden Treasures boutique, which also suffered during the riots and is locally owned too. It is located in the Ferguson “City Walk” which was a recent new development over the past several years to bring a series of specialty shops together in close proximity that many larger cities have sponsored. The first building to burn to the ground this past summer was a Quik Trip gas station that quickly became the gathering point for many demonstrators. A small family-run insurance brokerage was across the street, and this time got its share of rioters and arsonists. Imagine trying to run your storefront behind plywood covering what once was your windows. They still want to operate in town too. Last but not least is Mimi’s Bar and Grill, another restaurant that has been around for 20 years. Earlier this summer, they purchased the remainder of the building that they didn’t own, and saw their business drop to nothing. There are obviously many more places in town that could use your support. These are just a few of the ones that I know of. Please take a moment and send in some money, whatever. I know they will appreciate your support. David: You are to be saluted for this effort. Ferguson is a beautiful, historic town whose name has now become the title of an international social movement. Perhaps it can serve as the epicenter for needed changes, but in the meanwhile, these businesses can use our support. Thanks again for your note and initiative. They say 26 businesses have tapped into crowdfunding sources of funds.